A mom who sternly removed her son’s baseball cap after he forgot to take it off during the national anthem has been hailed a hero on social media. 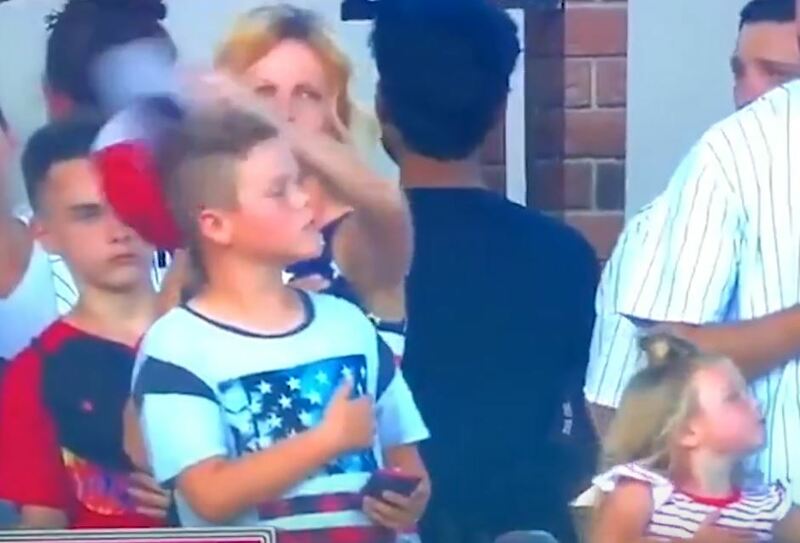 In the widely shared clip from the Sunday game between the New York Yankees and the Boston Red Sox, the unsuspecting boy can be seen with his hand over his heart as “The Star-Spangled Banner” played. There was only one problem — the kid forgot to take off his hat, and that didn’t go over too well with his mom. The unidentified woman, who is sporting a shirt emblazoned with the American flag, walked directly over to him and snatched the cap off his head. The boy, clearly used to this sort of discipline from his mother, gives no reaction whatsoever. Hilarious! Good job to the mom at the @Yankees @RedSox game who took her sons hat off during the national anthem. ?????? The mother, who unwittingly became a TV celebrity and parenting icon, certainly knows what it means to respect the flag and show appreciation to those who have laid down their lives our freedom. The playing of the national anthem at professional sporting events is a tradition steeped in centuries of American history. Indeed, it all started with baseball. And there have certainly been some belting performances. When Red Sox third baseman and U.S. Navy sailor Fred Thomas’ performed a stirring rendition of “The Star-Spangled Banner” in 1918, The New York Times decided not to run its sports editorial piece as an exposition of the contest, but instead chose to describe, at length, Thomas’ stirring vocal performance. The yawn was checked and heads were bared as the ball players turned quickly about and faced the music. Jackie Fred Thomas of the U.S. Navy was at attention, as the stood erect, with his eyes set on the flag fluttering at the top of the lofty pole in right field. First the song was taken up by a few, then others joined, and when the final notes came, a great volume of melody rolled across the field. It was at the very end that the onlookers exploded into thunderous applause and rent the air with a cheer that marked the highest point of the day’s enthusiasm. So, remember, sing it loud when you stand for the national anthem this Independence Day. Oh, and take off your hat.